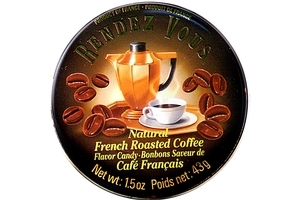 Rendez Vouz Natural French Roasted Coffee Flavor Candy (Bonbons Saveur de Cafe Francais) in 1.5oz (43g) pocket-sized tins. Elegant French all natural Natural French Roasted Coffee flavor hard candies in sophisticated tins! Product of France. Ethnicity: American, Austrian, Belgiums, Dutch, English, European, Finnish, German, Netherlandi, Polish, Spanish..
Shirakiku Ramune Carbonated Drink (Strawberry Flavor) - 6.76 fl oz.